Who said toys are only for kids? Figurines of cartoon characters and dolls will decorate any interior. Looking at you mysterious and knowing look, with bookshelves, cabinets and sofas, they raise the spirits in moments of despondency, bringing you back to childhood. 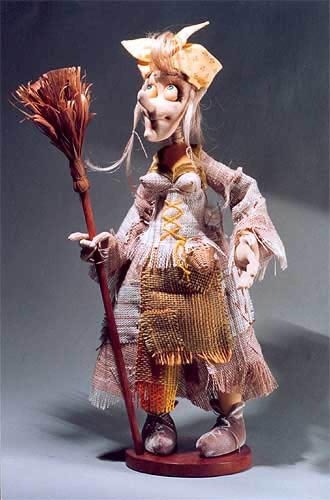 You can make yourself and put in the room such being, for example, Baba Yaga. Make a doll, combining two techniques: molding salt dough and the technique of soft toys. For salt dough, take a Cup of flour, half a Cup of salt "Extra", 125 ml of water, 2 tablespoons of Wallpaper paste and vegetable oil. Mix the flour with salt, dissolve the Wallpaper paste in water, add gradually to the flour glue solution and oil, knead thoroughly. Place the dough in a plastic bag and put in the fridge for at least half an hour. Sew the parts to the body (exactly the diameter of the bottle), arms and legs (no hands and feet). Arms and legs are stuffed with cotton or polyester batting, sew the binding to "empty" the body, paste it in the body of the bottle, gluing the fabric near the neck. Foil-make a ball the right size, glue it to a test – this is the head. Create a face Yaga as you imagine it. For hands, roll sausage, prelucrate its one end, flattened at the end with a knife, cut fingers. You can cut only a great remaining schedule. To feet make any shoes from elegant shoes to sandals. Attach the head to the neck, cover it with dough – it will be neck. Put the skeleton of the hands and feet on the foil and dry in the sun 4-5 days. During this time, sew clothes: shirt (long sleeve) from a burlap apron and scarf. After drying, draw the witch's face, glue the hair and the hands and feet. Cover all the details of the test varnish. Still time to dry. Put your Baba Yaga. Tie the handkerchief. You can add decoration in the form of beads, add one more shawl on the shoulders, stitch the vest. The doll is ready.